Ari Minkov (4.5) rallied from a pawn-down position to upset NM Mark Kernighan & retain his Kenilworth Summer Tournament lead. Greg Tomkovich (4.0) moved up one spot with a pair of wins over Max Sherer. I'm still =3rd (now at 3.0 with Kernighan), thanks to a very lucky win vs. Mike Wojcio. As in Tuesday's game at West Orange, my opponent missed a decisive sac on d5 (see diagram below) & was victimized by a desperado Knight sac. ... 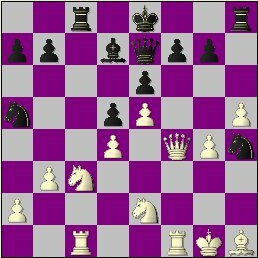 There were a bushel of mistakes in the aforementioned's middlegame but the opening should be of interest to Caveman Caro-Kann fans. In other action Jim Cole beat Harry Smith and Renna-Mazzillo was drawn. Here's the current standings page, plus 4 of Thursday's games in Java-replay & zipped PGN. I've added Mark Kernighan's win over fellow NM & frequent rival Peter Radomskyj to the West Orange replay page & PGN file. KST Director Greg Tomkovich has informed me that the 3rd round game between Ari Minkov & Mark Bilenky was won by the former, not the latter. Item #162 & the standings page have been changed to reflect the proper result. My apologies to Ari & any affected parties. 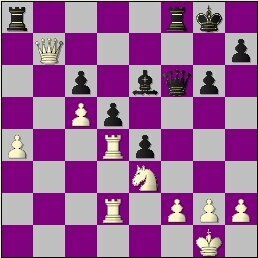 The Kenilworth Chess Club won its 3rd straight road match with a 4.5-1.5 win at West Orange last night. Kenilworth fell into 0-1 hole, due to a board 6 forfeit (Where was Joe Renna?? ), but Ari Minkov tied the score at 1, I kept things level, Joe Demetrick provided a 2.5-1.5 lead, Mark Bilenky clinched the match & Mark Kernighan put the icing on the cake. Please come back Friday for more coverage on this event & round 4 of the Summer Tournament. Bob Sherry (1812) won the 15-Minute Tournament in Springfield last night, with a 3-0 count. Mauricio Camejo (2094), Ari Minkov (1955) & Ted Mann (1463) tied for 2nd, at 2-1. NM Mark Kernighan directed the 8-player swiss. Interestingly, the last 7 tournaments at Barnes & Noble, have been won by 7 different people!! Don Carrelli of the Checkmate CC & Pat Mazzillo of the Kenilworth CC were among the winners at yesterday's Westfield Quads. Don, playing in just his 2nd event, went 3-0 in section 5 & now has a provisional 1547 rating. Pat scored 3-0 in section 6 to raise his rating 89 points. Ari Minkov (3.5) & NM Mark Kernighan (3.0) kept their places at the top of the Kenilworth Summer Tournament leader board with wins over Mark Bilenky & Greg Tomkovich. Ed Selling (who defeated Joe Renna) & I won to join Greg in a 3-way, 3rd-place tie at 2.0. Richard Lewis, meanwhile, scored a full point against Max Sherer. Harry Smith & Pat Mazzillo drew. Here's the current standings page, plus notes to my nice win over Joe Demetrick in both Java-replay & zipped PGN. P.S. - The 2nd round replay & PGN file files have been amended with 2 more KST games. We now have 12 of the 21 played thus far. I've added the Lewis-Kernighan score to the 2nd round files (Java-replay... zipped PGN) & corrected the Bilenky-Goeller result. There will be an unrated Quick Chess Tournament at the Checkmate Chess Club on Sunday, June 24th. It will start at 8:30 p.m. & be 3 or 4 rounds in length, with a G/10 or G/15 (+ a small delay/increment) time control. NM Mark Kernighan is directing. Click here for the details. Sorry for the delay in adding the Bilenky-Goeller game to the 2nd round replay & PGN. I needed some sleep, then decided to revise the notes to my draw vs. Minkov. Please replace the latter in your files. In a previous post, I incorrectly gave the date of the upcoming match between Kenilworth & West Orange. It will take place on Tuesday, June 26th (not 6/19). There were 8 games played in the 2nd round of the Kenilworth Summer Tournament including my draw against event-leader Ari Minkov. 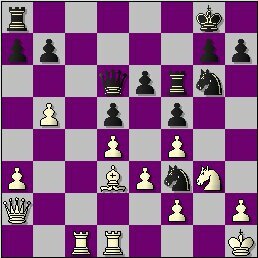 I played poorly (again) & was hit by a nice shot at turn 22 (see diagram below) but, like last week, managed to survive a clear disadvantage & pawn-down ending. Minkov now leads with 2.5, a half-point ahead of NM Mark Kernighan & Greg Tomkovich; who, along with Mark Bilenky, Ed Selling, Mike Wojcio & Joe Demetrick & Joe Renna, took full points last night. Here's the Java-replay page & zipped PGN file with my interesting battle; plus the standings page. I expect to add Bilenky-Goeller tonight & the Lewis-Kernighan score at some later point. 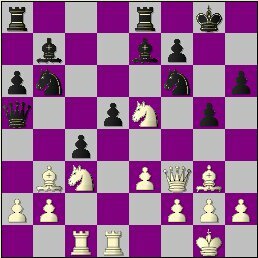 This past weekend, I surfed over to the West On Chess blog and made a gruesome discovery... one of Jim West's recent posts featured my 1987 loss to James Salisbury! As I read on, I discovered that this game was featured in the Atlantic Chess News 19 years ago. Touche'! Maybe, by re-publishing it, J.R.W. is getting back at me for noting that he doesn't provide pgn files for his readers. Anyway, I thought you folks might be interested in my comments on the contest but, before giving you the links, I'd like to provide some color. For the record, it took place in the 3rd/final round of a 6-player, bottom-quad swiss at the Newark Airport Ramada Inn, which a few months earlier, was a Howard Johnson's. I was actually rated 1749 (p/17), at the time, & in the midst of a 0-6-1 futility streak, which was extended by an opening-round draw with Barry Jaffe (1722); who, with his spouse, later appeared on WOR-TV's Richard Bey Show, in a "Sexiest Wife" competition. I s*** you not!! Following an unrecorded between-rounds skittles draw with the aforementioned 1595-rated Salisbury, which is, in fact, the root of my obsessive-compulsive, score-keeping habit, I notched a win at the expense of an unrated little kid named Tristin Barr. 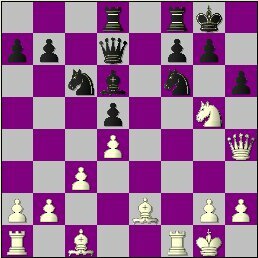 As for the game in question, the first 15 moves were interesting & decently-played by both sides but I went straight downhill after that. My opponent's Exchange sac at turn 23 was good but zombie-walking into a mate in 3 ultimately did me in and led me to give up OTB chess for nearly 3 years. Without further due, here, is the annotated Java-replay & PGN. The Bilenky-Kernighan & Renna-Yanpolsky games were posted last night. The Kenilworth Chess Club will be taking part in the Kenilworth Centennial celebration on Saturday, June 16th. We will be setting up an information table, giving a simultaneous display, etc., across from the Veterans building on South 21st Street (starting around 2 p.m.) & need members to help out. If you can spare an hour or 2, or even a few, that afternoon, please contact Joe Renna; who is coordinating our role in the event. I wonder if my cousin Mary & her husband Richie will be there!? They live only 8 blocks away. The away match at West Orange is set for Tuesday, June 19th. This year's inter-club matches will feature 6 boards & an U1800 average rating. Interested KCC members should contact Joe Demetrick. 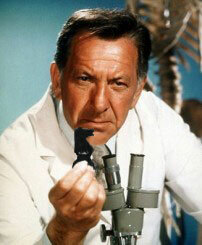 I have annotated last night's Huaman-Wojcio contest & added it to the existing round 1 replay page & zipped PGN files. I welcome any & all Summer Tournament submissions & will put them online but, aside from my games in the event, I'll probably comment on just 1 game per week. The increasingly popular Kenilworth Summer Tournament got underway last night, with Ari Minkov taking 2 games & the early lead. Last year's winner Greg Tomkovich, 2005 KST champ Mark Kernighan & Juan Huaman also got off to good starts. 2. The tournament will run from June 7 through August 30. 4. You may play anyone in the tournament. The first time you play an opponent, the lower-rated player gets White. In subsequent games against the same opponent, you will alternate colors. 5. You may not play the same opponent more than four times. 6. You get one point for a win, a half-point for a draw and zero for a loss. 7.You may play as many or as few games as you like. The more you play, the more points you can accumulate. Maximum 2 games per night. 8. The winner is the person who has the most points at the end of the tournament. 9. The prizes will be 60% for first place, 30% for second and 10% for third (rounded to the nearest dollar). I'll try to get a few more games for you this weekend. For now, here's the "Battle of the Bloggers" in Java-Replay & PGN plus the week 1 standings. Expert Mauricio Camejo (5.5) & NM Mark Kernighan (5.5) tied for 1st in last night's 5-Minute Tournament at the Checkmate CC. Bob Sherry (5.0) finished 3rd & Juan Huaman (4.5) placed 4th in the 8-player field. The KCC's Thematic Tournament, scheduled for last Thursday (5/31), was postponed or cancelled. Perhaps it will be re-surface in the fall as a free event - with a more interesting opening, a slower time-control and an expert/Master lecture on the chosen subject.